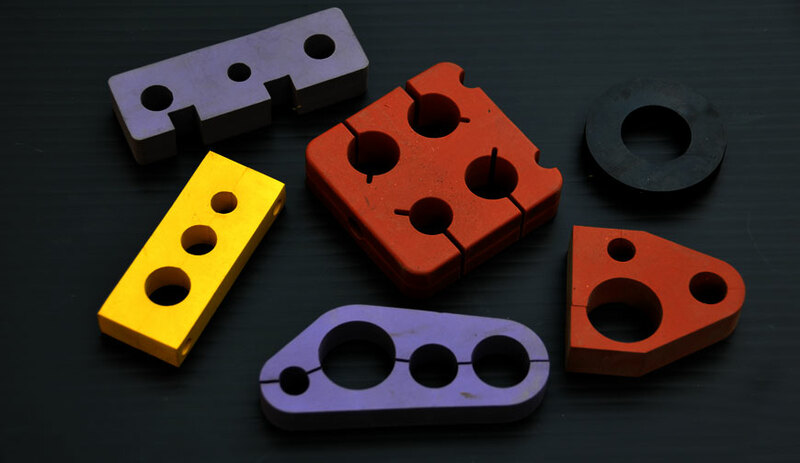 An ideal technology for precision part production from flat stock, West Coast Gasket's Water Jet Center can output complex flat patterns from almost any material, including rubber, metal, plastic, glass, ceramics, composites and many others. All positioning and cutting can be to +-.005", controlled by CAD drawings or DXF, files. This valuable, in-house capability is ideal for short-run production, just-in-time manufacturing needs. tooling and prototype development. Smooth finishing can eliminate otherwise costly secondary machining. An extremely clean operation, no noxious gases, liquids or oils are used in the process. Capabilities include machining of a wide range of materials and thicknesses, cutting of extremely hard, reflective and non-conductive materials. End products are not subjected to excess heat, thereby retaining structural integrity.